THINK ON THIS: School Sign Displaying the 'N-Word' Racist or Much Ado About Nothing? FORSYTH COUNTY, Ga - A sign draped across the side of a Forsyth County high school raised some eyebrows and angered school officials early Wednesday. The sign contained a lyric to a popular song by the artist 'Drake'. 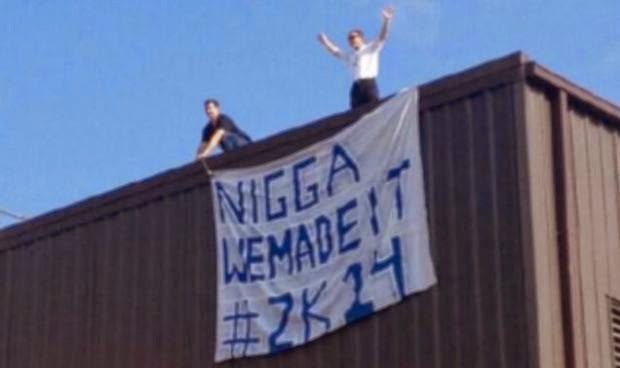 The signs proclaimed "N***A we made it!" Students used the reference as part of their departing 'senior week' celebration. In addition to the sign, photos also show the message was written on windows. "South Forsyth High School Parents: This morning, without our knowledge, students placed a derogatory sign with a verse from a song by Drake on our school as a senior prank. We removed it as soon as it was brought to our attention and deeply apologize for their behavior. This is unacceptable and I promise you that the students will receive the appropriate consequences for their actions." I can honestly say that this story let's me know I am officially old because there is no way in hell something like this could have happened at my high school (which was predominantly black) without there being some sever repercussions. You can say we're living in a different age, but if anything tragedies like those that happen to Trayvon Martin and Jordan Davis tell a different story. You can replace the 'er' at the end of that word with an 'a' but it still doesn't change the meaning of the word especially when the person who uses it is something other than Black. We can pretend all day that we have evolved, but the truth of the matter is that word is still very potent no matter how many people try to dilute its power. I hope the people in Forsyth County (which is predominantly white) uses this as a teachable moment for their kids, but I doubt that will happen. I'm sure they'll say it was just an innocent prank and they don't understand why so many people are upset. But people are upset and they will continue to be upset despite what rappers will have you believe. Yes we have made great strides when it comes to race relations in this country, but believe me we still have a very long way to go. And this latest demonstration is just another episode in the continuing debate about the N-word. They were wrong and they know it. The word should never be used. It doesnt matter how its used it is dead wrong. I wonder how extreme the punishment will be. Unfortunately, the n-word debate will never end.